TRADER 9: Trade of the day, VRSN!!! Friday morning VRSN had a huge gap down after its ability to raise prices was limited as part of its deal with the U.S. government to keep operating the registry. 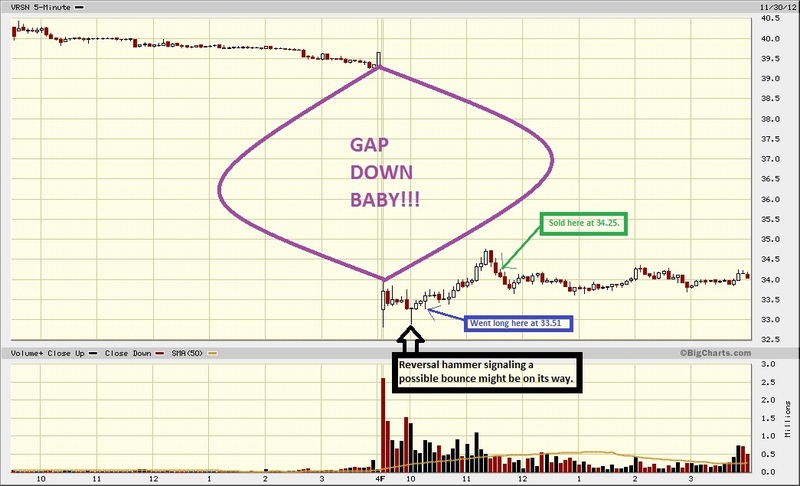 That news made no sense to me, I thought the gap down was way overdone. Plus, I knew people were expecting this news and had short orders in. Since it was Friday I knew most of the shorts will be covering today and not trying to hold it over the weekend. I expected a bounce, and when the hammer formed at 10:00a.m ET, I bought 400 shares fifteen minutes later at 33.51 looking for it to retrace back up a bit before the close. I hate having over 10,000 dollars in any trade for now, so when i saw two bearish engulfing candles I decided to sell it at 34.25 for a .74 point gain. What was your stop after you got in? It was a mental stop at 32.95 when I kept watching it. Then I put in a stop order at 33.23 after it started moving in my direction and got up from my computer.